If you think I might be talking about or talking to the little people called smidgen, I’m not. Instead I’m talking about a littlest tiniest cooking measurement I know. A smidgen is a common measuring baking term. It is used to measurement dry ingredients that are smaller than a teaspoon. Other common terms are Dash and Pinch. 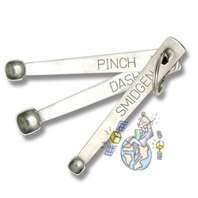 SMIDGEN – A smidgen holds 1/2 pinch or 1/32 teaspoon. 2 smidgens = 1 pinch. Millions of Americans are hopelessly addicted to Sugar be it high-fructose corn syrup (HFCS) or the chemical varieties loaded with aspartame and sucralose. Both are extremely harmful and dangerous to health. 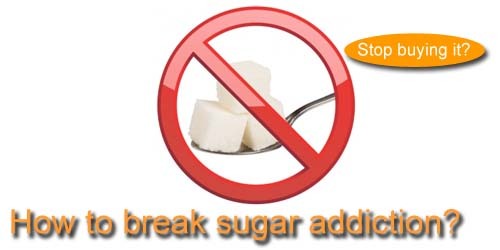 I found Stevia and used it help kicked my sugar habit for good. I am still working on cutting down carbs but when it comes to sugar I have got it covered. I have written other post about Stevia but there are a few loose ends that needed to be cleared up about what forms to use and how to measure it. Stevia comes from the whole plant and many manufactures are producing it as a supplement. But there doesn’t seem to be standards and each product has its own consistency. I set out to explore this and found it rather fun for each seems to provide its own taste. It has become for me a kind of art form which adds fun to my cooking. Stevia – A sugar replacement. It is a naturally sweet plant native to Paraguay that is 30 times sweeter than sugar in its unprocessed form. With more than 1,000 studies and patents on Stevia, it is known to be all-natural, contain zero calories and have a zero glycemic index. Through a patented process the pure glucoside can be extracted from the Stevia leaves and turned into an intensely sweet powder that is 300 times sweeter than sugar. What Stevia product do you buy? I have been a user of SweetLeaf’s Stevia products for almost a year now. It was one of the first products I found to use when I was learning how to eat myself to wellness. But there are some difficulties in using the product. First problem is finding the right product. 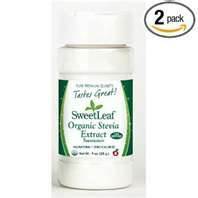 I use the brand name SweetLeaf, Its ingredients should be labeled “Stevia leaf extract” or use the name Stevia rebaudiana. As I have covered in earlier posts, Coco-Cola’s Truvia and Pepsi’s Pure Via are not derived from the whole plant. The have been given the ok (GRAS) from the FDA but their product is not Stevia. Both products use rebiana and erythritol. Erythritol is an extract from the stevia plant not the whole plant. The full effects of Erythritol are not known it is a new untested product. The Second Problem is what form to buy. Over time many forms of the product have been developed. The problem is, most of the products are of different concentration and forms. I have found powder, liquid (clear of syrup), tablet, dried leaf (whole or crushed not as sweet). The Third Problem is how to measure it. Stevia does come in the familiar self-serving packets, but I find the other forms mix and taste better. So I set out to explore the different forms of Stevia and find which ones mixed better, depending on what I am cooking is there a better form to use like liquid vs. dry, and which had a better taste. Are there advantages to the different forms. 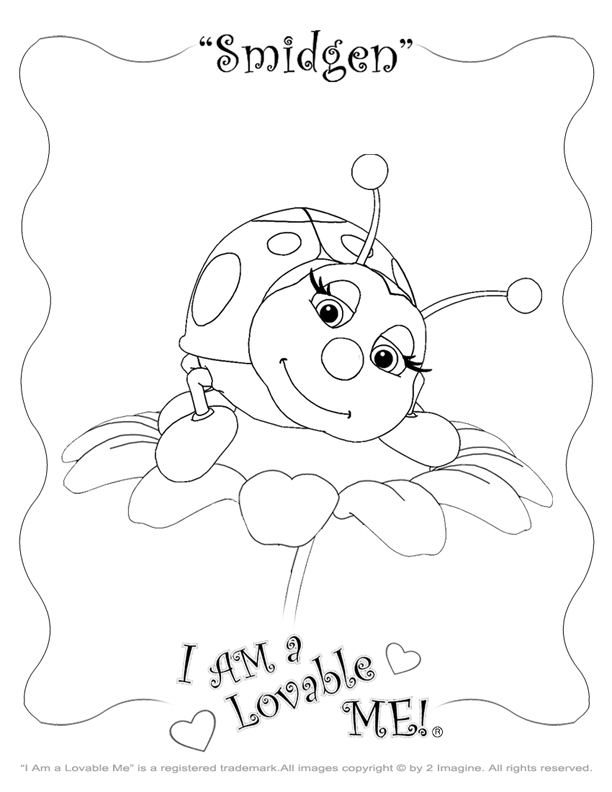 The first thing I found was the tablet where there isn’t measurement necessary. This works great when I am away from home and want to improve the bitterness of Coffee or Tea. The next problem I addressed was how to measure the different powdered forms and then I found the Smidgen. I am so happy with the product and the different varieties I have settled on. I find cooking with stevia has added fun to my cooking. 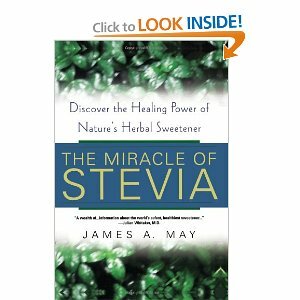 I thought I’d take a brief moment to cover the history of Stevia in the United States the man who made it all possible. I am impressed with his product and after reading his book am very impressed with the man who took on the FDA and won. James A. May did battle with the FDA and won. James A. May is the founder, President and CEO of Wisdom Natural Brands TM, producer of SweetLeaf R brand products and Wisdom of the AncientR herbal teas. Jim introduced Stevia leaf products and Stevia extracts to the US market in 1982, making him the first person to bring Stevia to America and helping him the title ‘the grand godfather of Stevia’. James May invested everything he had in developing Stevia. “There was my initial vision for the future, followed by the financial havoc that came from my investing everything in a business that soon appeared doomed to failure. There were constant fears that the FDA would totally outlaw and confiscate my stevia”. In 1991 the FDA banned the product, then in 1995 revised its stance and permitted stevia to be used as a dietary supplement but not as a food additive. The product had been successfully sold in Europe and Asia as a food product with no reported harm since the 1930. In 2008, Jim May became the first to be able to announce a GRAS (Generally Regarded As Safe) status for a Stevia product. In May 2010, Jim was presented the Lifetime Achievement Award by SteviaWorld International for his nearly thirty years of championing Stevia. From the very beginning, Jim could foresee being part of a great food revolution when he began selling products that are 100% natural, Jim has become one of the pioneers in the movement embracing healthier food currently sweeping America. Let me repeat because there is still confusion; Stevia is now regarded as save (GRAS) by the FDA. Cuts and Abrasions Stevia concentrate kills harmful bacteria by starvation, which purifies or sterilizes wounds, thus allowing your body own healing process to progress. Many forms of Stevia available. If you cook much at all, you’ve likely read a recipe that calls for a dash, a pinch or even a smidgen of a particular ingredient. While in cooking mistaking a dash for a pinch probably won’t make a huge difference, in baking the difference could really be big. Baking is more of a science than cooking and knowing the difference between a dash, a pinch and a smidgen could be the difference between a good final product and a really great final baked masterpiece. A Dash is the largest it is about 1/8 of a teaspoon, A pinch is next it is typically considered the amount of dry ingredient that can be pinched between your forefinger and thumb. Generally considered to be 1/16 of a teaspoon. Now to the smidgen it is the smallest and considered to be 1/32 of a teaspoon. If you want to be accurate and make your recipes as tasty as possible, don’t forget the smidgen! The next time a recipe is staring you in the face with the seemingly arbitrary measurement terms of dash, pinch, or smidgen, you’ll be armed with the knowledge of exactly what these small amounts are. Don’t forget that pinch of salt, dash of pepper, or smidgen of cayenne pepper when it’s called for in your favorite recipe. A pinch has historically been defined as “an amount that can be taken between the thumb and forefinger” but without any definite equivalent in other units of measurement. A dash was originally considered a liquid measure, a small but indefinite amount. More recently the term has been used as both a liquid and dry measurement. Be sure and visit our more extensive page of other cooking equivalents and measurements. I have used all three products with great success. But one must read the label equivalents very carefully. Finely milled stevia leaves, green powder Native to Paraquay Not sweet. 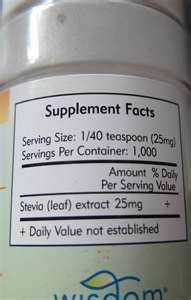 I have found Stevia products that have many different Serving Per Container. There is one that says 2,500 servings. Serving Size is something that needs a little experimentation also. Some Stevia products say use a Teaspoon, but I have found that to be way too much and I like the taste be sweet. I find 1 teaspoon means ¼ teaspoon or smaller. 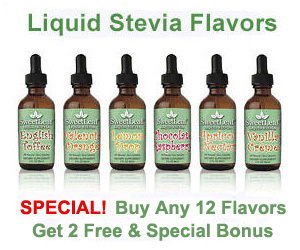 Stevia has liquid forms all come with an eye dropper and you have to do your own experimenting to adjust to your taste. I hope you find your own form of Stevia and enjoy them as much as I do. Thanks L-Jay. Yes it does not make a lot of sense the artificial sweetners has received the OKay and have so many side effects. Thanks for the remark.